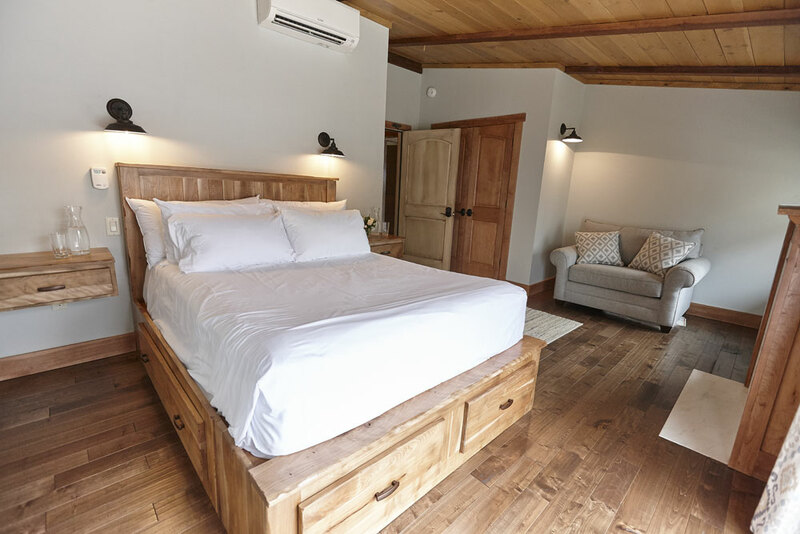 There are 16 newly renovated rooms at Seesaw’s, including 3 luxurious cabins with southern exposure and a seven bedroom lodge. 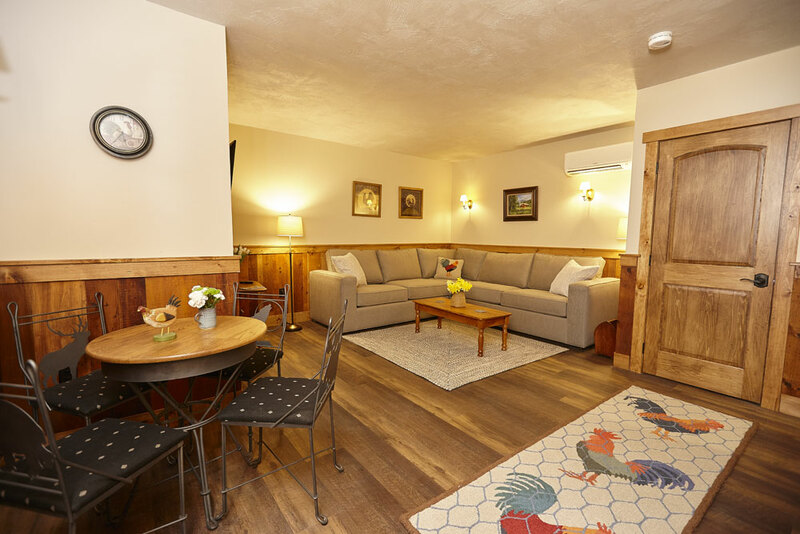 All feature mud rooms with radiant heat floors, living rooms with exposed beams, and kitchens and bathrooms with all of today’s modern comforts that generously provide for your stay, whether for family reunions, couples’ weekends or weeklong retreats. 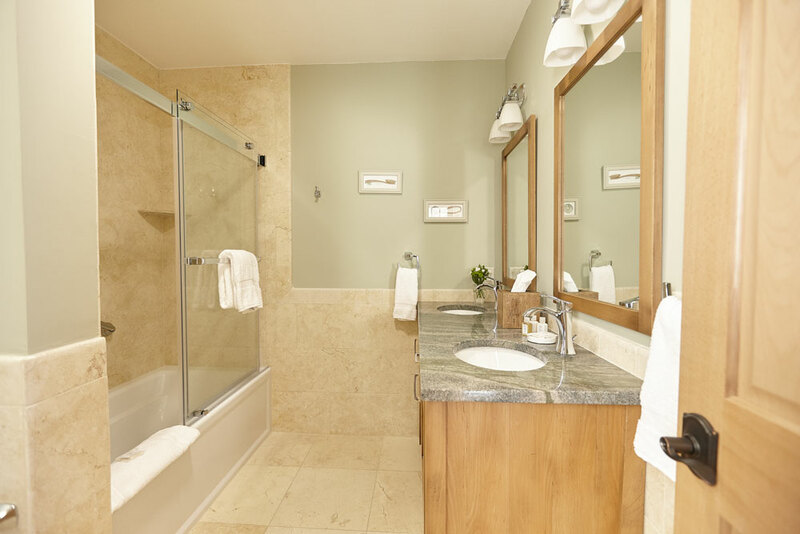 All rooms offer gas fireplaces, private en-suite bathrooms, large LED smart TV’s, complimentary wifi, individually controlled heat and air-conditioning. 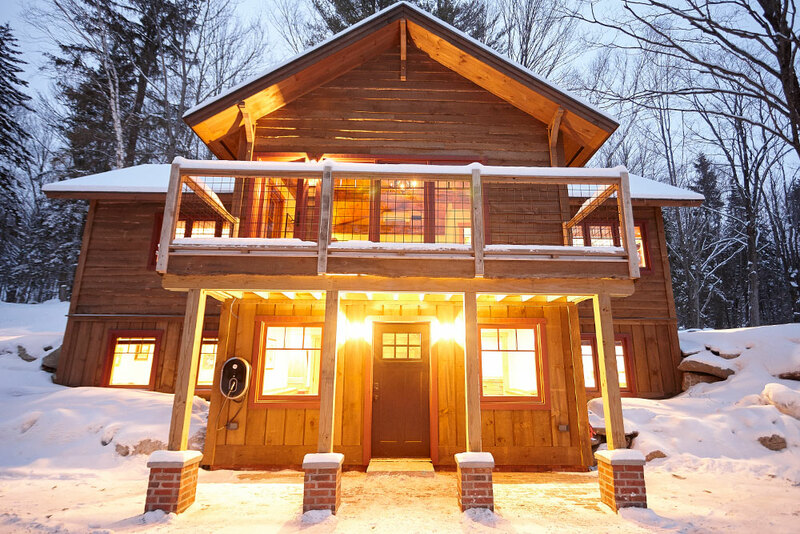 We look forward to welcoming you to Seesaw’s Lodge! 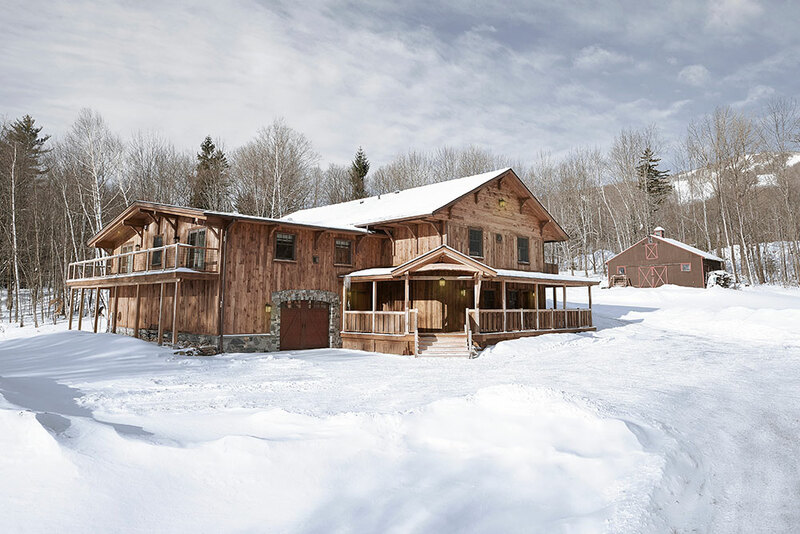 Formerly known as the Ski Loft Residence and Warehouse, the main lodge was originally used to assemble skis in the ‘50s and ‘60s. 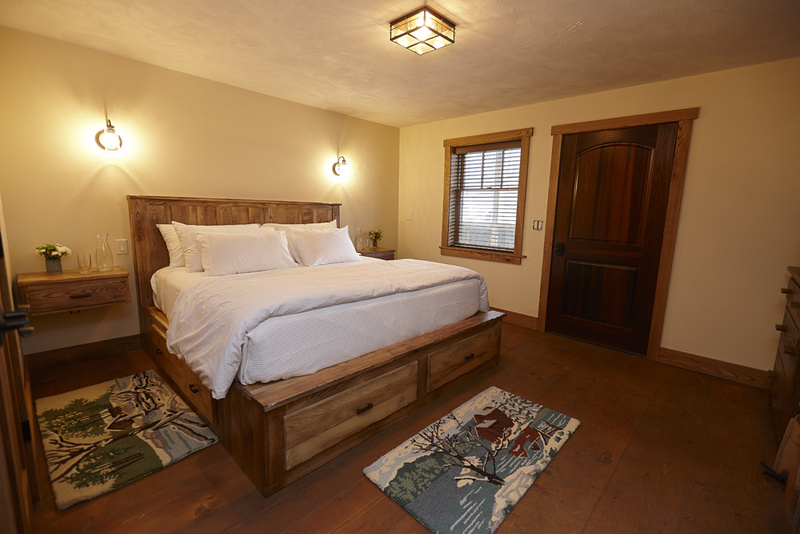 Today the carefully restored triplex includes six spacious suites and an Innkeeper’s quarters, each inspired by a local tree. 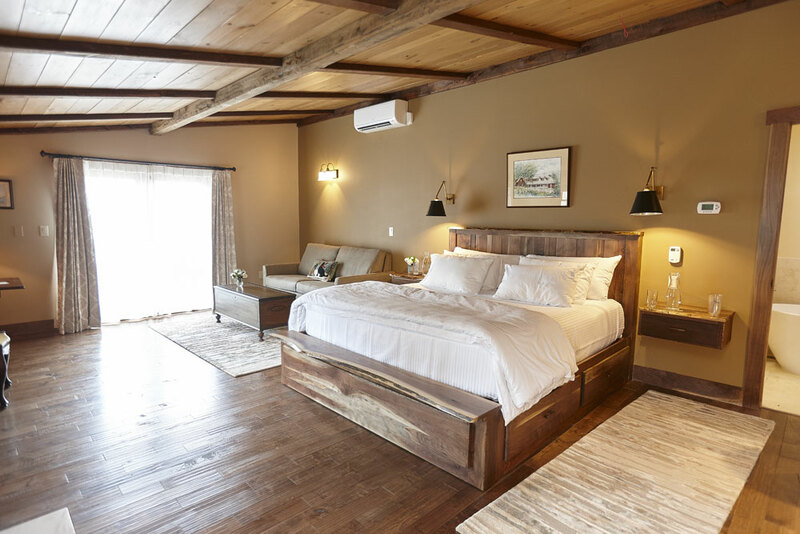 The lodge pays homage to the camaraderie of the original Seesaw’s, incorporating elements from the inn’s history that give the rustic retreat its unique charm and rich character. 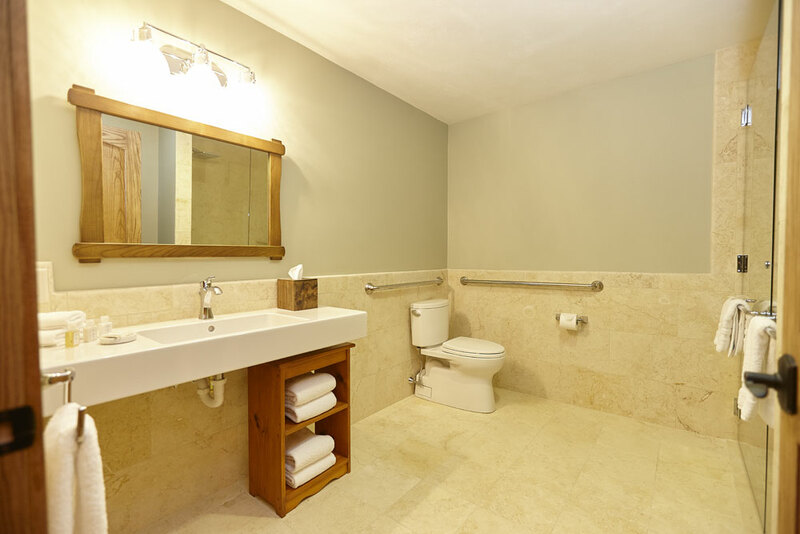 Take the first right at the top of the stairs and this hallway will bring you to the Birch and Cherry rooms. 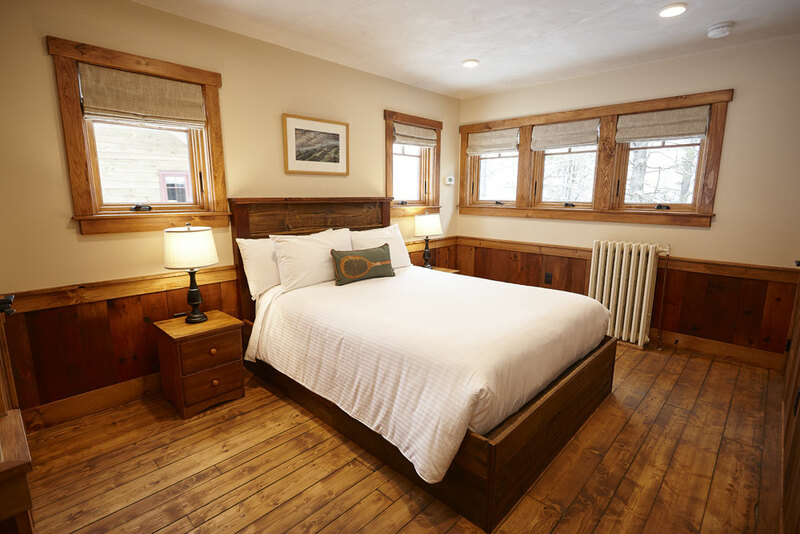 The Birch room, aptly named for its western views of classic Vermont birch tree clusters, also has an entrance through the French doors off the deck. 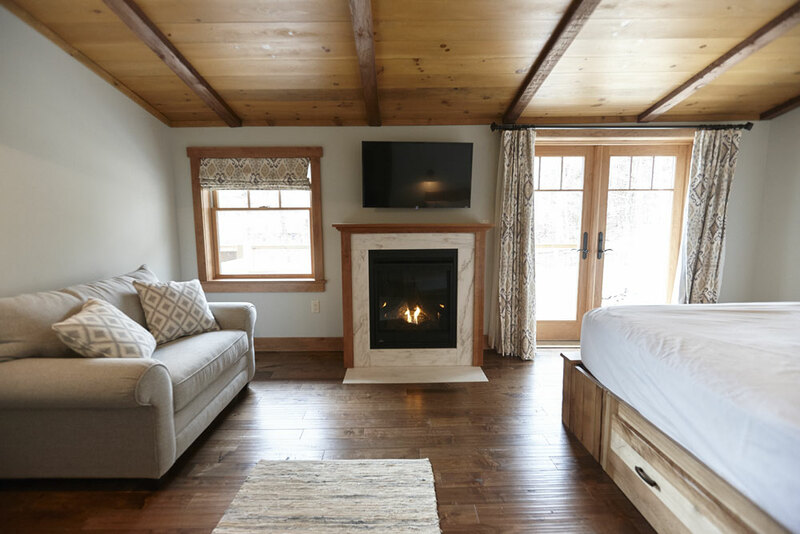 This cozy room includes a custom queen birch bed, gas fireplace framed in local marble, a small sitting area with a twin pull-out. 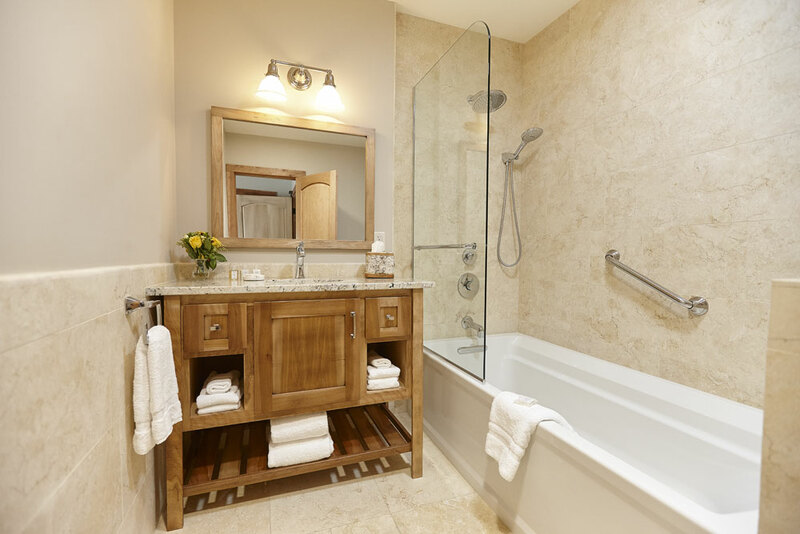 Other features include a 6’ tub shower and roomy closet with birch built-in closet drawers. The Beech room is on the second floor and faces north with views of Bromley. 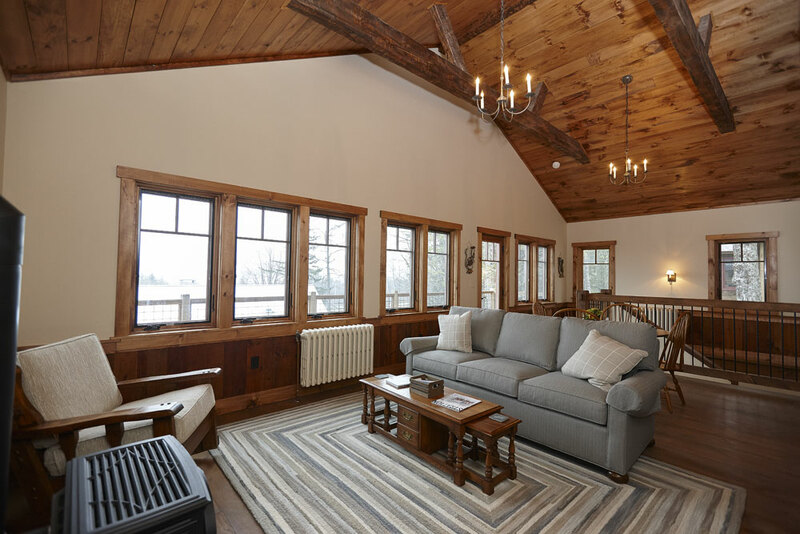 It is comprised of a built-in king bed and sitting area by the gas fireplace, as well as French doors leading out to the deck with a true Vermont-inspired view overlooking the apple trees and a horse barn. Look up and you’ll see the spectacular views of Bromley’s eastern ski runs. 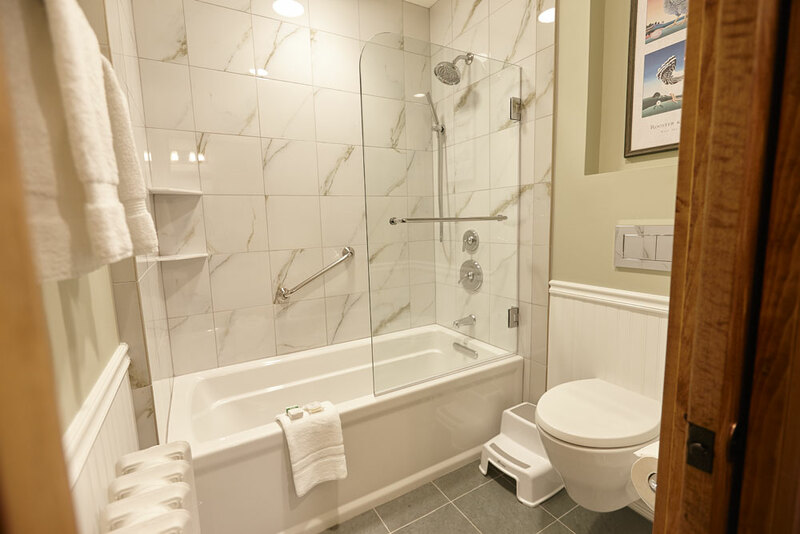 Enjoy the tub, a large shower head and all the necessary modern bathroom amenities. 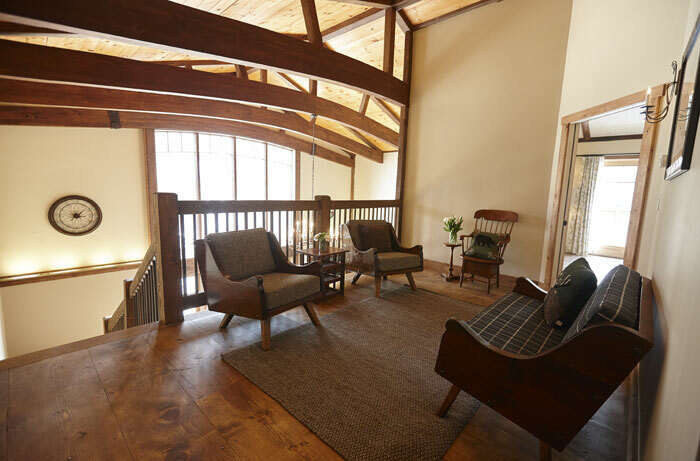 The first-floor Oak room is fully ADA accessible with a private outside entrance to the covered front deck, as well as an entrance into the lodge. 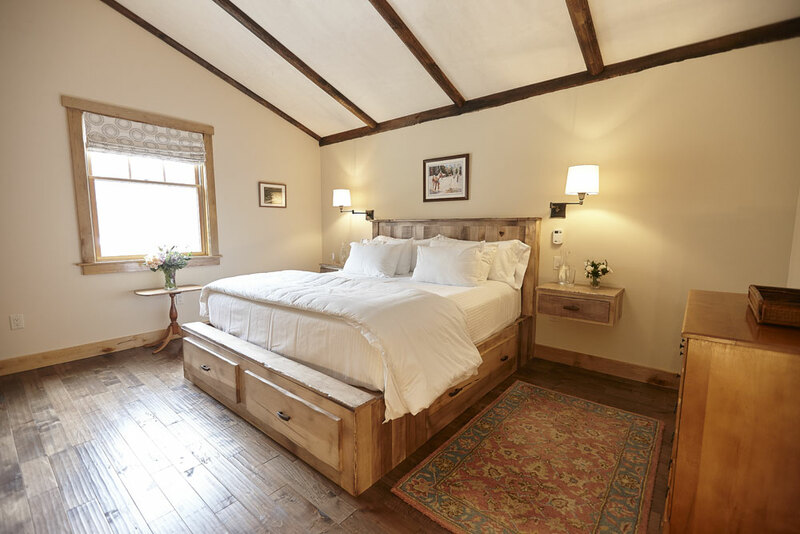 This rustic room features a custom-made oak king bed, gas fireplace and luxury glass-encased shower. The Cherry “room” actually consists of two rooms: one bedroom with a king bed which opens up into a living room complete with sectional queen sofa. 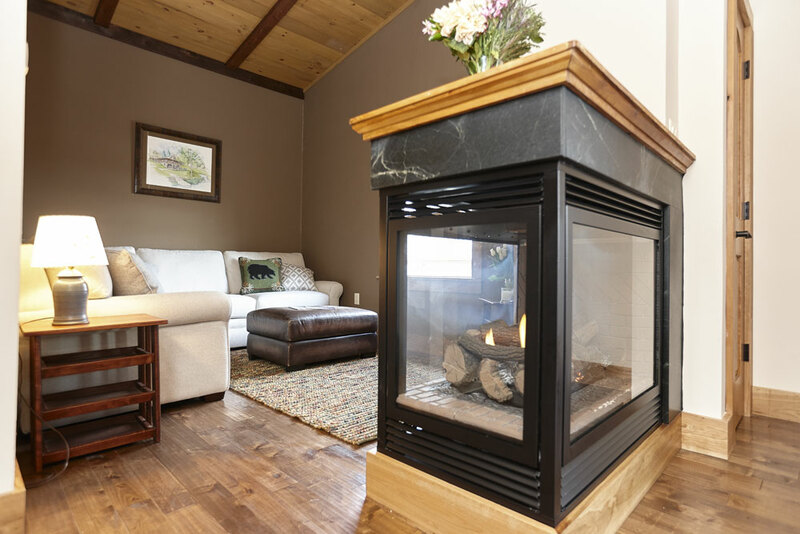 The two rooms are divided by a 3-sided gas fireplace that you can enjoy from all vantage points of the suite. 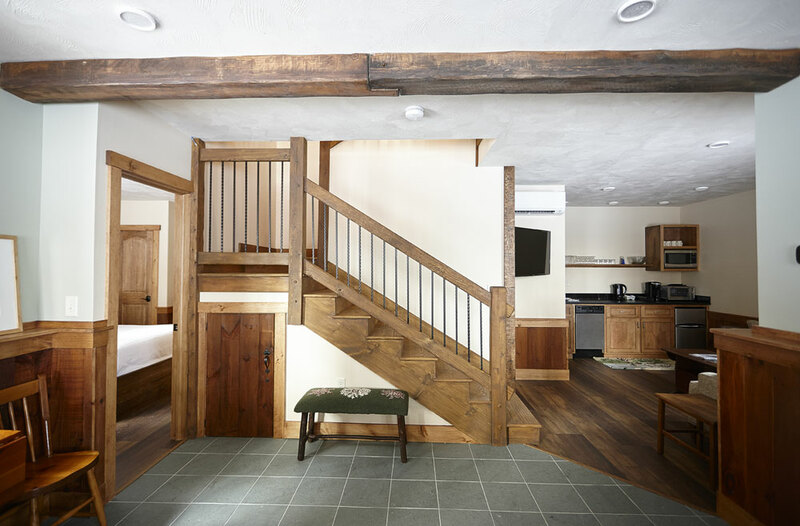 Sweeping southern views of Stratton Mountain run from the bedroom to the living room. 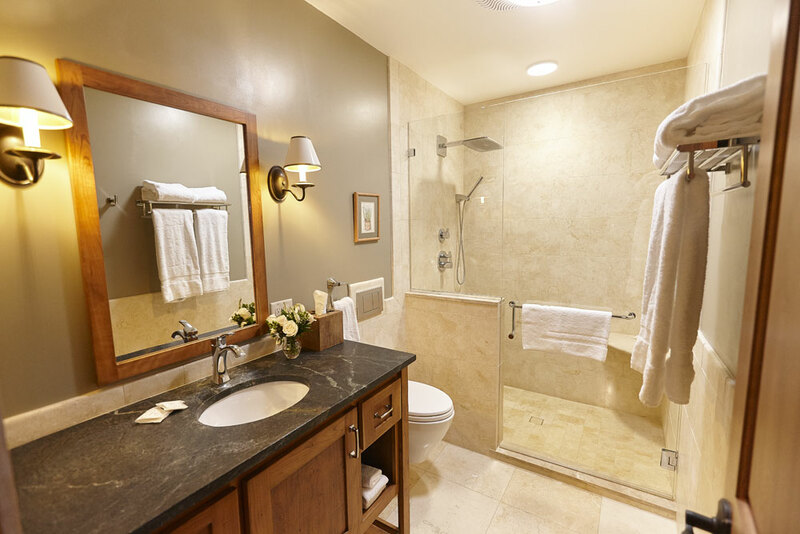 Not to be outdone, this suite is complete with ensuite bathroom and spa-like shower. 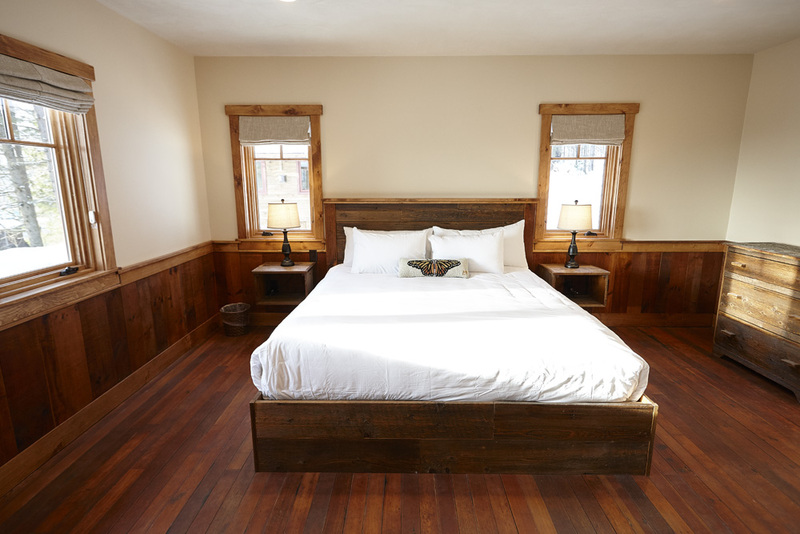 The second-floor Black Walnut room is a spacious romantic corner room suite with a king bed, gas fireplace, antique secretary desk, and a large sitting area with a queen sleeper sofa. 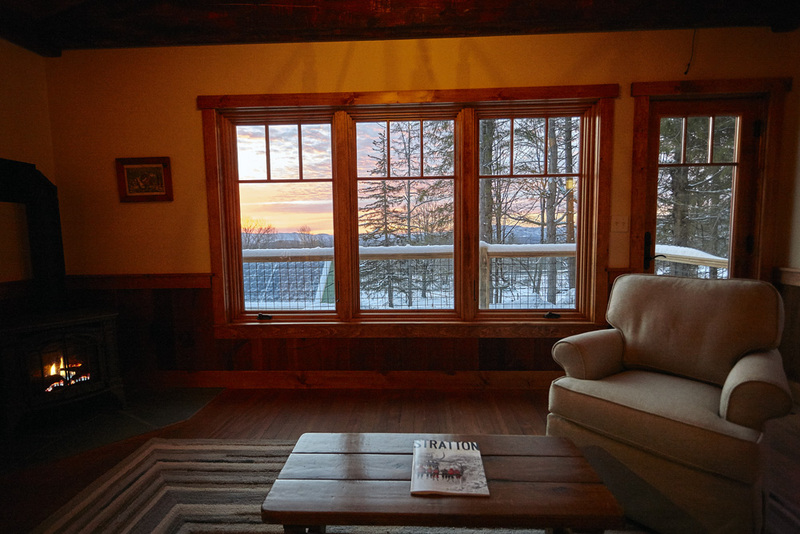 The French doors out to the deck lead to spectacular sunrise views to the east, as well as winter views of Magic Mountain and year-round views of Stratton Mountain. 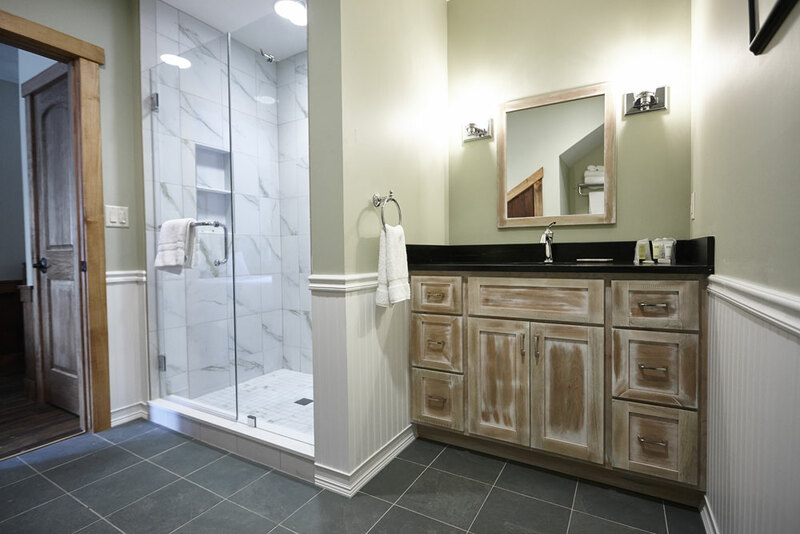 Not to be outdone, the spa-like bathroom features a luxurious deep soaker tub, rain/waterfall shower head and double vanity. 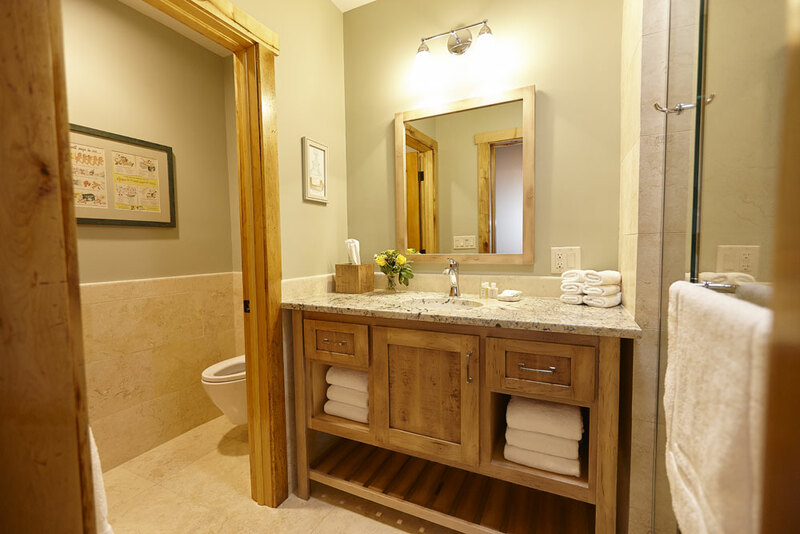 It even includes a walk-in closet with walnut built-ins to accommodate lengthier stays. 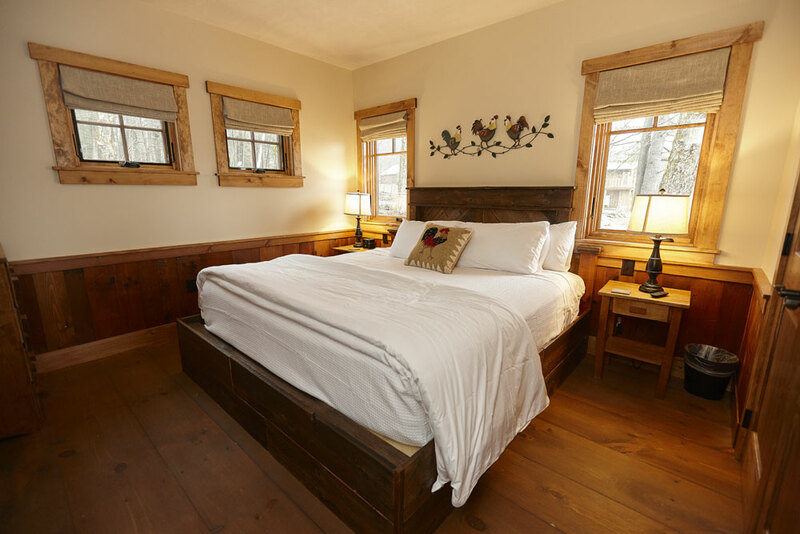 Also known as the family suite, the Maple Suite features two bedrooms (queen and king), a bathroom and living room complete with a sectional sofa, old barn board hutch and original Johnny Seesaw’s desk. 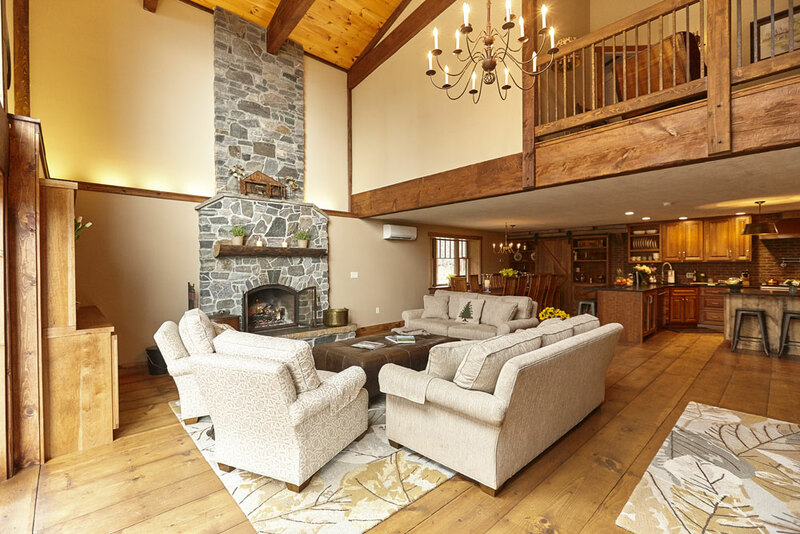 With fireplaces in both bedrooms and living room, it’s sure to keep the whole family toasty in Vermont winters with Bromley Mountain ski runs as the back-drop. 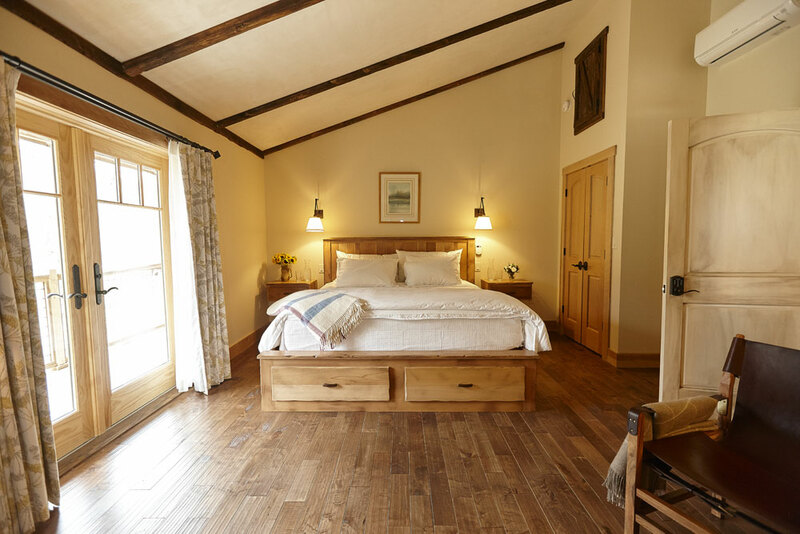 This barn-inspired suite has French doors in the living room that lead out to the deck and overlooks the old horse barn, meadow and garden beds to keep an eye on the kids playing outside in the summer. 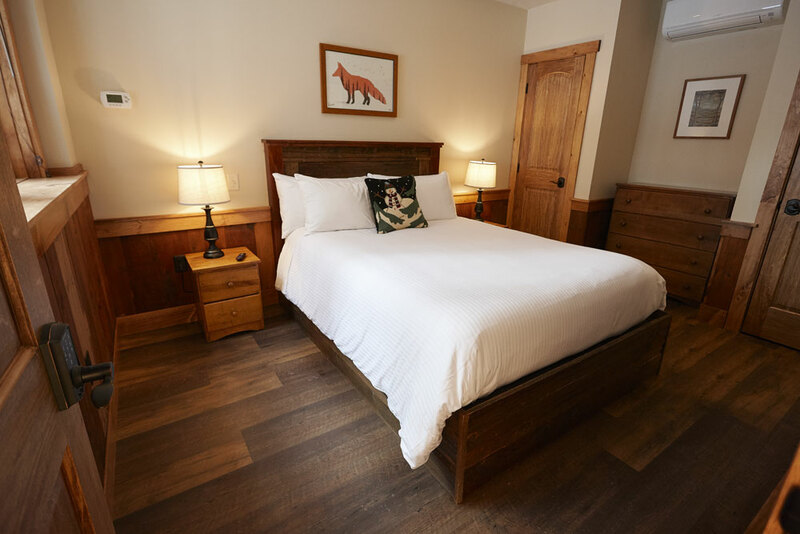 The first floor, affectionately called the Fox’s Den, has a king bed with picture windows facing south with a large, bright bathroom with a spacious walk-in shower and cozy living room with queen pull-out sofa sectional, bistro table (seats 4) and kitchenette. 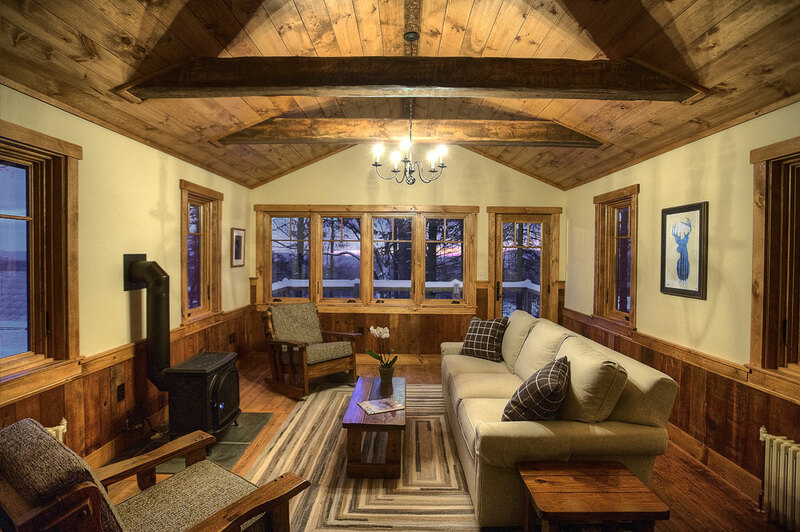 Come home to roost in the second-floor living room, where the gas fireplace and panoramic mountain views make for one cozy coop. 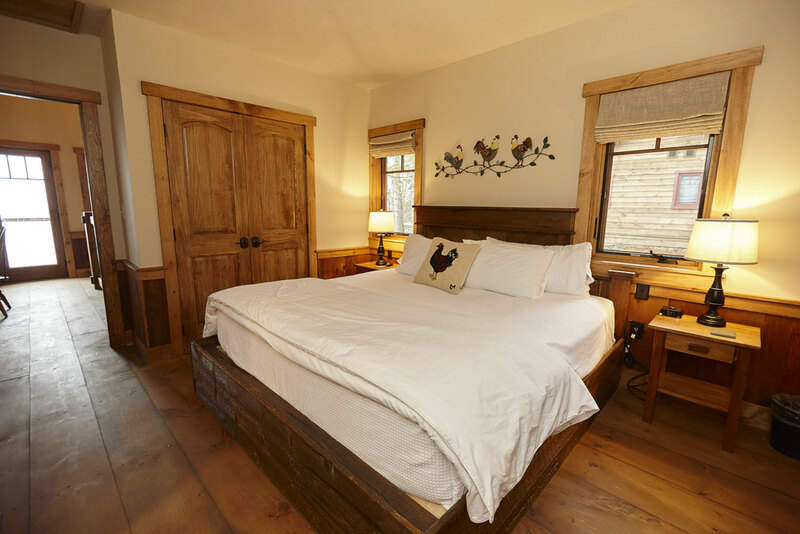 Featuring two king bedrooms, aptly named the rooster and hen, joined by a Jack and Jill bathroom, this unit includes a kitchenette and balcony with mountain views evoking a rustic feel but with all the creature comforts of home. 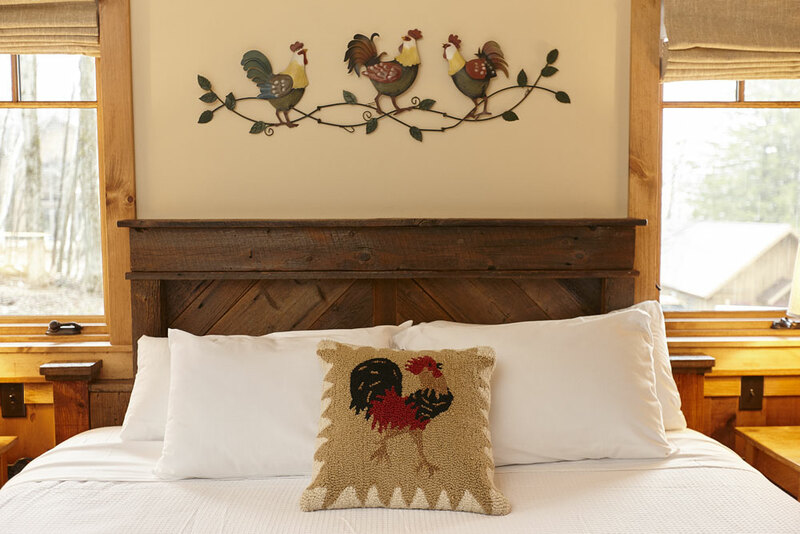 Believe it or not, this cabin’s first guests were of the feathered variety. 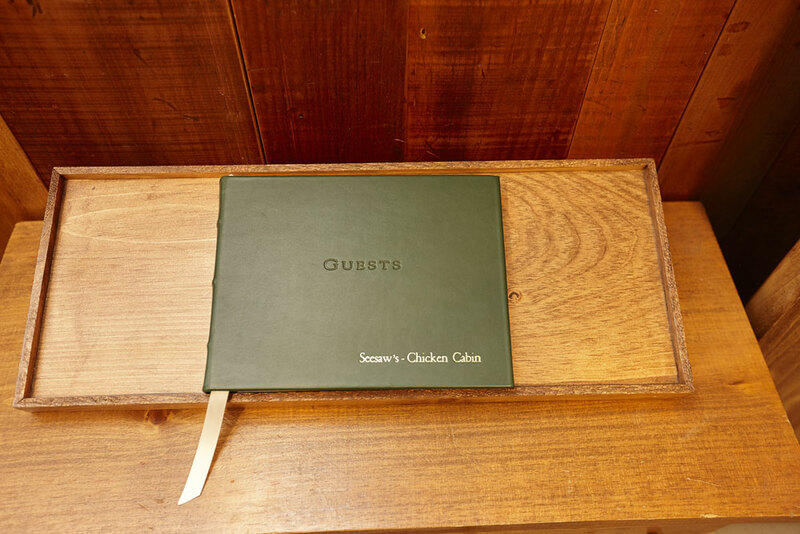 The Chicken Cabin served as a coop during World War II, when a farm was established to see the inn through lean times. 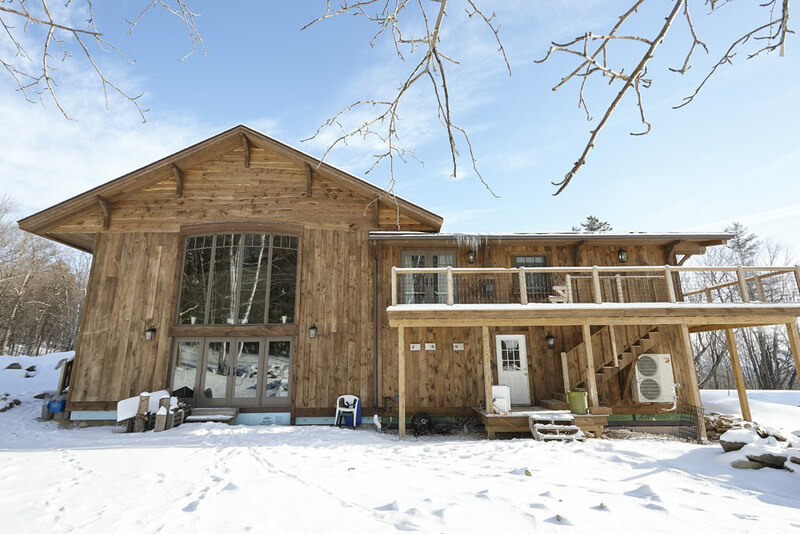 The coop was converted into lodging in 1946, so rest assured that the chickens are long gone. 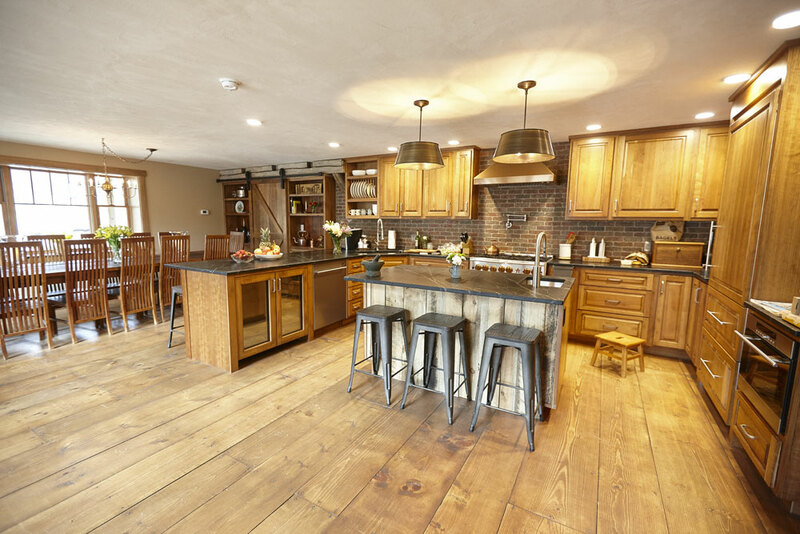 What remains are live-edge pine siding and original wainscoting that capture the rustic charm of the classic Seesaw’s experience. The patio entrance is built out of slate from a local quarry, nodding to the inn’s heritage and local roots. 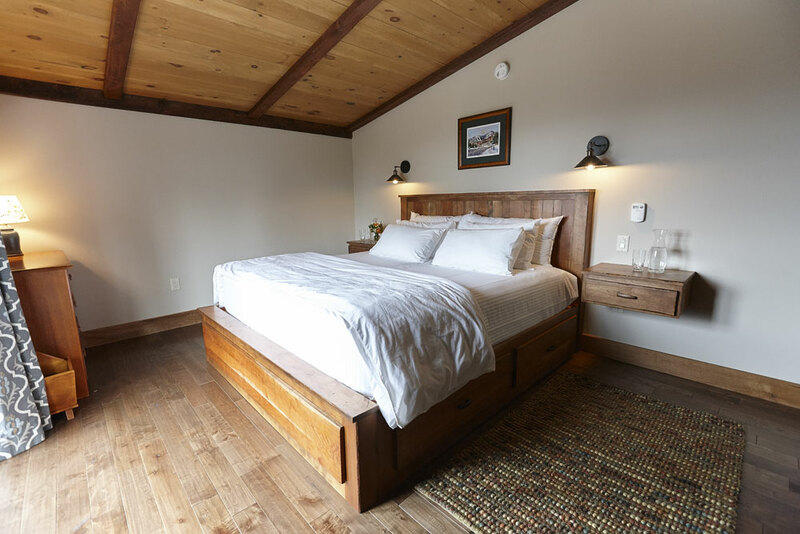 The three-king bedroom, two-bath cabin features kitchenettes on both floors for maximum ease and comfort. 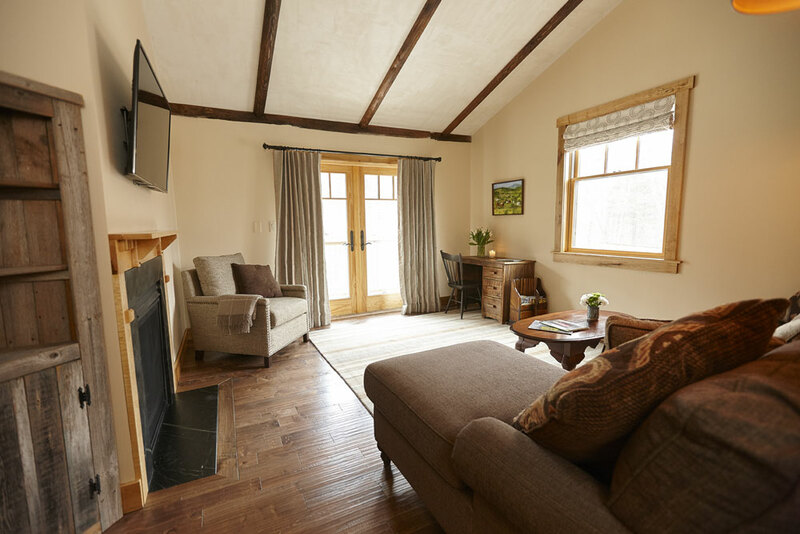 Come home to roost in the second-floor living room, where the gas fireplace and panoramic mountain views make for one cozy coop. 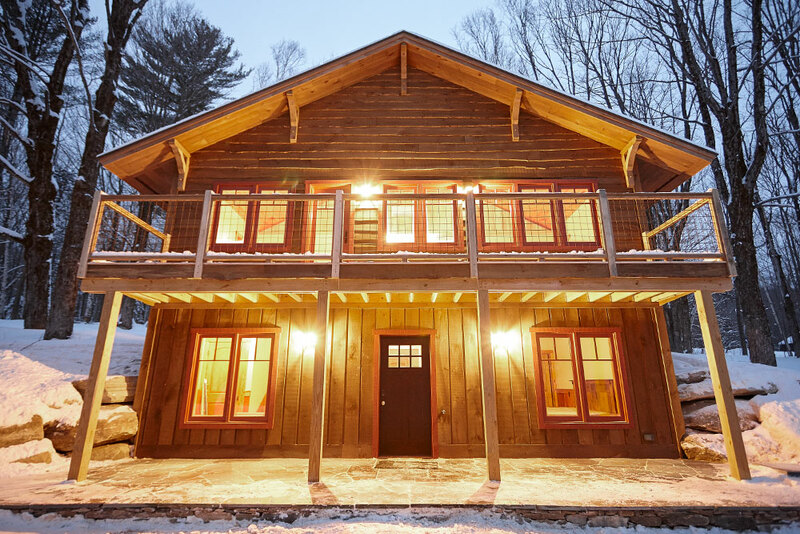 No rackets required—this cabin gets its name from the unique red clay tennis court it once sat behind. 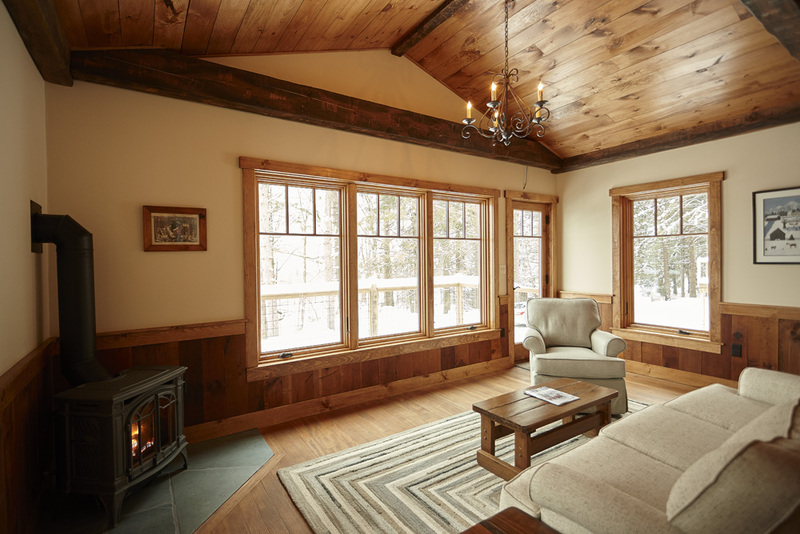 The thoughtful restoration of the midcentury cabin preserved the flooring and framing of the second floor, as well as the original wainscoting. The distinctive front porch is made from local Dorset quarry marble and repurposed from the old pool on the property. 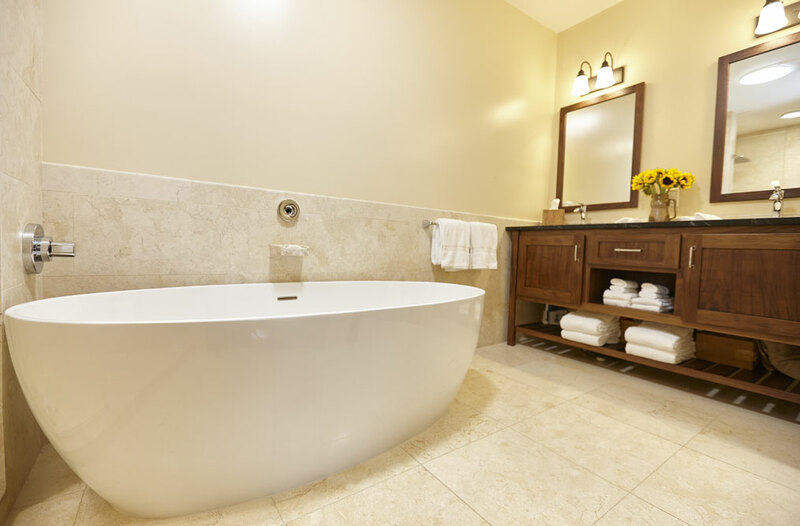 Each of the three queen bedrooms has its own bath, giving guests ample space to recharge and unwind. 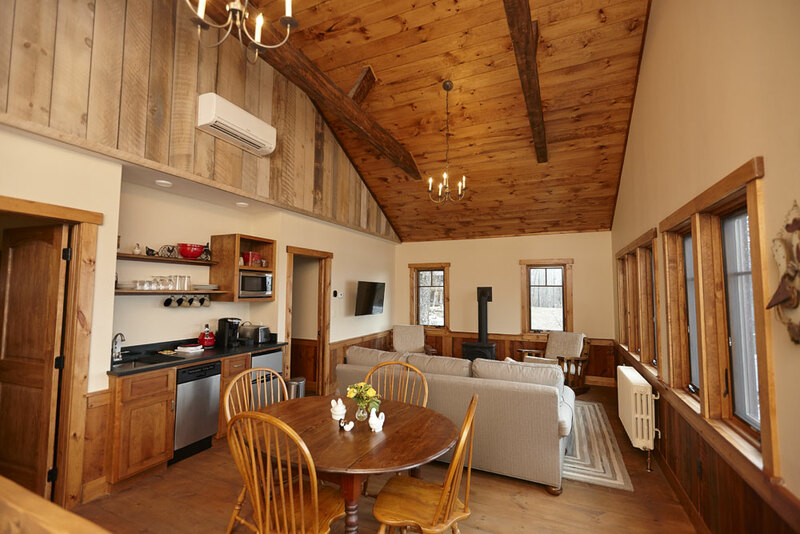 The cabin also features a mudroom, modern kitchen, living rooms on each floor, and a second-floor gas fireplace. 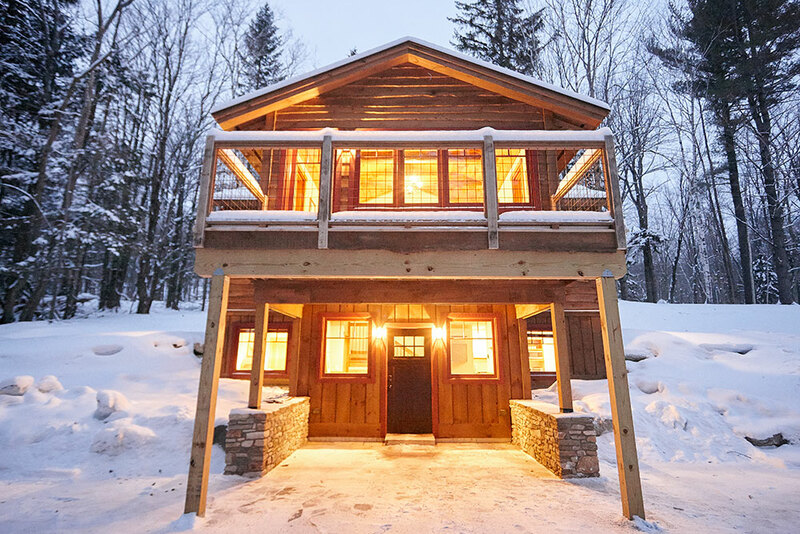 Step back into the ‘50s, when this distinctive cabin was first built. Named for its unusual butterfly roof and T-shaped floor plan, the 2,000 sq. 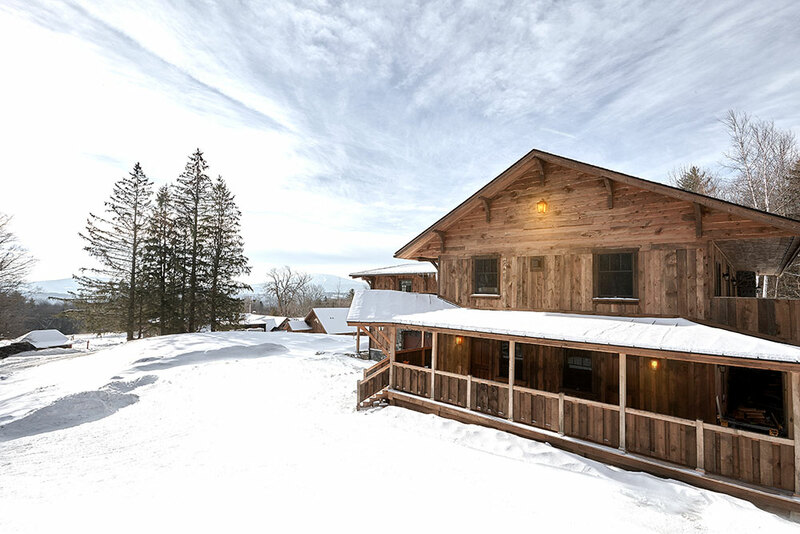 ft. cabin has been restored to preserve the unique architecture and rustic charm. 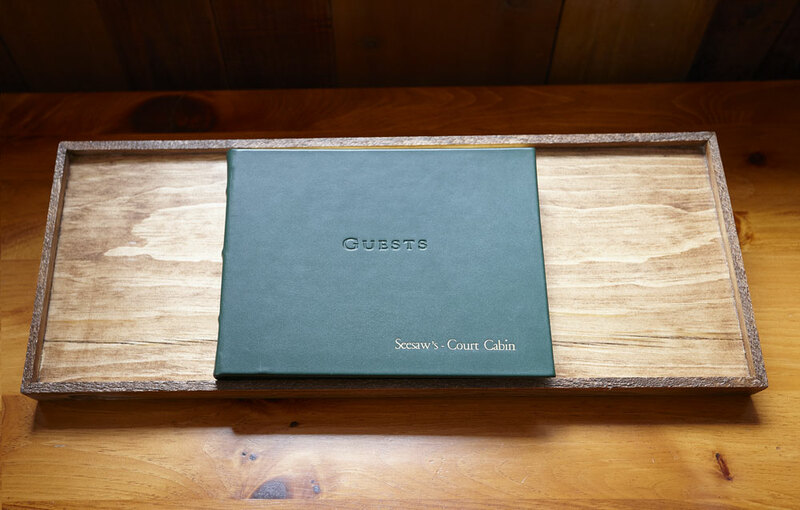 Salvaged wainscoting, live-edge pine siding and refinished furniture pieces evoke the inn’s storied history. 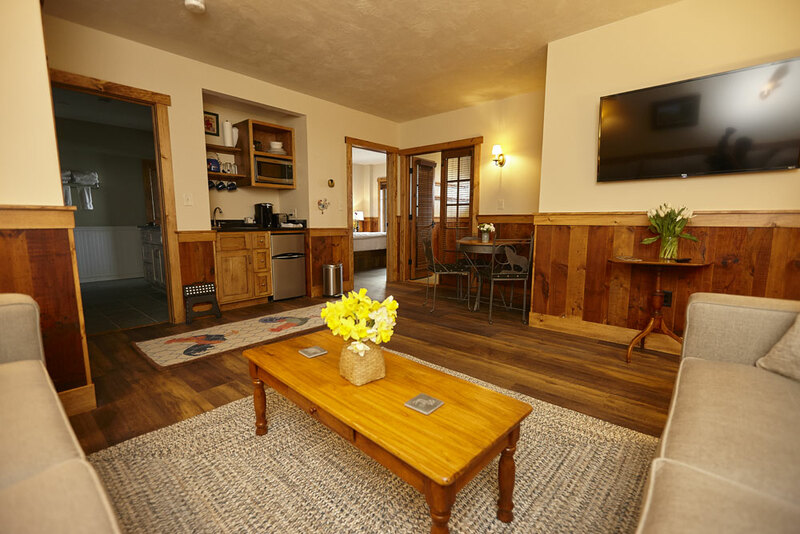 With three king bedrooms, three baths, a new kitchen and radiant heat, modern updates make the cabin cozy and comfortable. 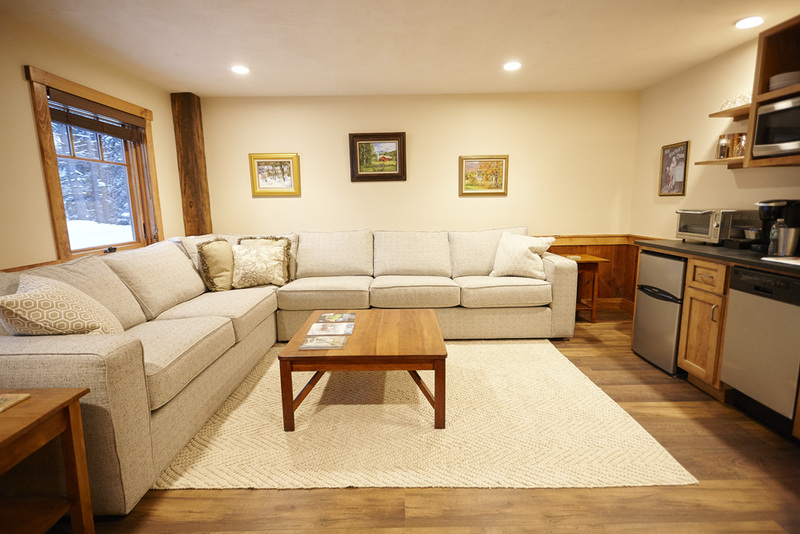 Stash your gear in the spacious mudroom when you come in from a day of adventure, then unwind in front of the fireplace and take in the sweeping views of the Green Mountain National Forest from the second floor living room.